Give the gift of a DIY CATIO PLAN! Upon purchase you will receive an email with a pdf download for the gift certificate redeemable for one DIY Catio Plan including the WINDOW BOX, HAVEN, SANCTUARY and OASIS style catios. 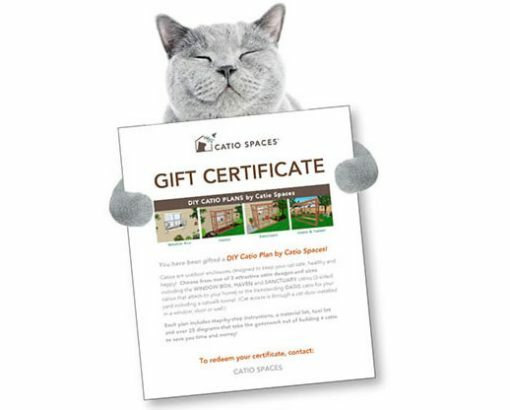 The recipient will email Catio Spaces their selected plan and size (along with your name) and will then receive a PDF DOWNLOAD of the plan. (Instructions included with gift certificate). 10% of your purchase will be donated to an animal welfare organization.